Special Representative for Venezuela Elliott Abrams speaks at the State Department in Washington, March 15, 2019. U.S. Special envoy for Venezuela, Elliott Abrams says Russia and the United States have failed to come to an agreement on how to resolve the crisis in Venezuela following talks in Rome. He did not rule out a future meeting between both sides and said the talks helped both sides gain a better understanding of each other's views. The United States Special envoy for Venezuela, Elliot Abrams, described the Rome talks with Russian officials on the crisis in Venezuela as “useful, substantial and serious.” He said the conversations allowed the United States to understand that “Russia sees the crisis in Venezuela as very serious, unlike President Maduro," mainly, Abrams said, in regard to the economic and humanitarian aspects. 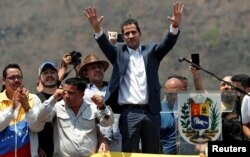 FILE - Venezuelan opposition leader Juan Guaido, who many nations have recognized as the country's rightful interim ruler, takes part in a rally against President Nicolas Maduro's government in Valencia, Venezuela, March 16, 2019. 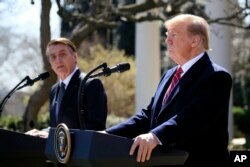 President Donald Trump and visiting Brazilian President Jair Bolsonaro speak during a news conference in the Rose Garden of the White House, March 19, 2019. "We are not looking for anything other than taking care of a lot of people that are starving and dying in the streets. What’s happening there is a disgrace," he said.